Although, still in nascent stages, Cloud based offerings are slowly rising on the preference list of Small, Medium and large businesses across the globe. Not only are cloud offerings more robust, it helps businesses to cut on their Infrastructure and resource costs. Most of large IT companies have already made their foray into cloud solution offering. 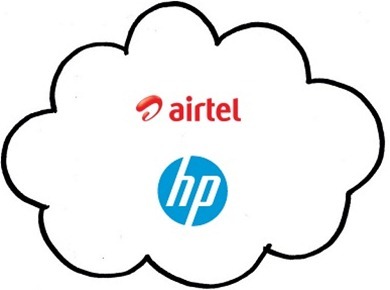 The latest one being Bharti Airtel, who have announced launch of their Cloud Enablement Platform (CLEP) in partnership with HP. CLEP will be using HP’s Aggregation Platform to offer hosted Software as-a-Service (SAAS) and Infrastructure-as-a-service (IAAS) to the small, medium and large enterprises on a pay-as-you-go model. Bharti Airtel, on its Cloud platform, will offer solutions like ERP, accounting packages, storage and compute. Going forward, Airtel is also expected to expand its cloud offering to other more diverse SAAS offerings especially for Small and Medium sized businesses. Bharti Airtel, being a end-to-end telecom provider, is much better placed to offer such cloud offering especially with their ability to offer bundled with their SAAS solutions with 3G and 4G connectivity. According to the press release – Bharti’s cloud platform was built with HP Enterprise Services using the HP AP4SaaS, integrated into Bharti Airtel’s existing network system. A key component of the HP Cloud Services Enablement portfolio, the AP4SaaS is a common platform from which Airtel can not only deliver IaaS but also Communications as a Service and SaaS, either hosted on operator premises or integrated with third-party SaaS providers. It provides a flexible set of web service interfaces for enhancing the Cloud Service Provider’s (CSP) customer portal and facilitates distribution, subscription, and consumption via a marketplace portal. In India, Tata is another Telecom provider who have already made a foray into offering cloud based services called Instacompute. Reliance also offers cloud based hosting services via Reliance cloud. Even non-telecom companies like Zenith also have cloud offering for Small and Medium sized businesses.